In the board game version of the popular Witcher video game series, you and your friends travel around a war-torn realm, completing quests for victory points. Though it has some very clever elements, the game is crippled by poor design decisions. Here's how I'd fix it. The Witcher is published by Fantasy Flight Games. As such, it has a gorgeous game board, tons of tokens, multiple decks of cards, and some nice unpainted plastic minis to represent the four playable characters. There's a set of attack dice, plus a special die for each character, and they're high-quality, beautiful dice. Two to four can play, each player taking the role of a "witcher" (monster hunter) roaming around fighting evils and completing quests. These quests, and the smaller side quests they include, grant victory points. And after someone has completed three quests, everyone gets one more turn, then the game ends and you add up the victory points. If you imagine a significantly more complicated version of Ticket to Ride (where you fight vaguely Celtic named monsters instead of building train routes), that's the general structure of the game. There are a few things this game does really well — so much so, that it's almost a great game. For instance, the four characters are totally unique and have their own unique ways of achieving things. Geralt, the main character from the games, is good at combat, and he can brew potions that make him even tougher. Yarpen, on the other hand, has a squad of helpers he can command to do various tasks for him. The sorceress Triss has some seriously powerful spells, and is especially good at dealing with undead creatures. The quests are generally interesting (even if the process of completing them is not — you mostly move from area to area collecting tokens of various colors), and they often have ambivalent results even when you succeed. 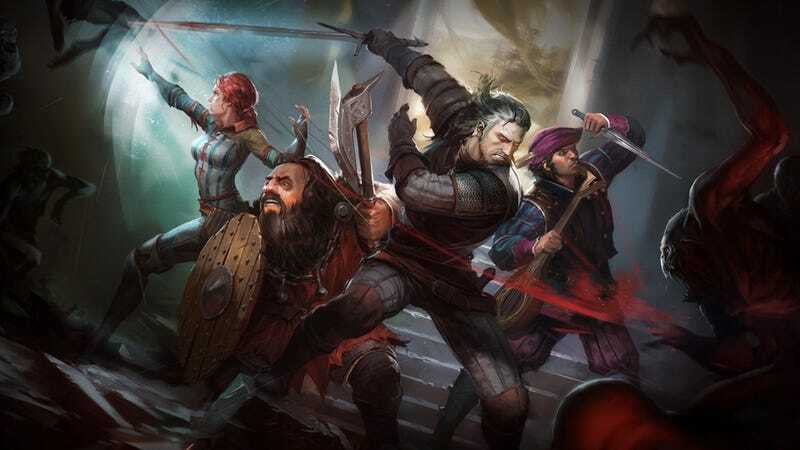 The flavor of the Witcher world comes through strongly — I've only played the video games briefly, and none of the people I playtested with had played them at all, but we all understood the world and the witchers' role in it pretty quickly. My favorite part of the game is how it handles injury. On your turn, you can complete two main actions, like travel, investigate an area, get some cards from your deck of spells and equipment, or something unique to your character. All these actions are laid out on your character sheet, and you place an action token on an action when you use it. If you're wounded by a monster or an encounter, you place a wound token on one of your actions. As long as the wound token is there, you can't take that action. You can never die, but you get progressively more useless as you get wounded, until there's nothing you can do but rest and remove some of those wounds. It's a really elegant system for slowing players down for getting hurt, without ever knocking them out of the game. Where did this game go so wrong? Oh, here and there. The Witcher is essentially a race. You need to get your missions done as fast as possible while still collecting as many side quest VPs as possible. Thematically, you and the other characters are on the same side, but this isn't a cooperative game, other than the support quests that give another player a few VPs while you gain twice as many. In fact, there's almost no interaction between players at all. You can leave the room when it's not your turn, because almost nothing your opponents do will affect you much. You can trade tokens with players in the same space, do support quests, and in a roundabout way, sometimes move monsters to regions your opponents are in or need to get to. But only Yarpen can do that regularly. A few of the Good Fortune cards let you steal from other players, but those cards are hard to acquire — you might see three in an entire game. There are plenty of opportunities to fix this, though. Each character has development cards specific to that character: potions for Geralt, spells for Triss, and so on. Most of these cards can only be activated once per turn, or require you to perform an action that puts tokens on them, which can be later spent to activate the card. There's no reason there couldn't be development cards that let you screw with your opponents. You don't want it to be too frustrating or happen every turn, but throw a monster in their way, steal some tokens just as they're about to complete a quest, or even wound them! This change alone would vastly improve this game. Alternately, you could play up cooperation. As it stands, support quests don't actually help your opponent get closer to their quests, it's just a couple of free VPs. What if there were cards that let you truly help an opponent get closer to a quest of their own, but that also gave you some significant reward — like the resources you desperately need to complete your quest. That would lead to some interesting decision making as you weigh these various temporary alliances and the cost/benefit as you approach the end of the game. The Witcher has a mechanic whereby the locations on the board are divided into regions, and each region has a space where some monsters, a bad luck event called "Foul Fate," or both of those, can hang out. Every time you end your turn in a region, you have to face one of the monsters, or the Foul Fate. If the region is empty, you move a token around a "war track" that puts a monster or foul fate into that region. This simulates all the chaos of the realm being at war. The problem is, you always have to deal with these obstacles, no matter how many you defeat. Every space on the war track dumps more bad stuff into the regions. There's never any sense of, "Well we cleared the undead out of that region, so it'll be safe for a few turns." It's just a relentless parade of terrible things that you have to deal with turn after turn. How to fix it? Make the war track a sort of meter that fills up. Maybe certain Foul Fate cards or monsters add a token to the war meter. When it fills up, a monster or FF gets dumped into your region. That gives you a few turns of reprieve if you can clear a region (and all the players rush over there to get side quests done while things are safe), but there's a sense of impending doom and growing tension as the meter fills up. It should definitely be filed by semi-random events, rather than at the end of every turn in an empty region, to increase that tension. I do not mind long games. I'll gladly play a three, five, or eight-hour game if the payoff is worth it. The Game of Thrones Board Game, Twilight Imperium, Empire Builder — these are all games I can play all day, break for dinner, then play some more. The Witcher is not like those games. Our first two-player game took about two hours, which is fine, but we were kind of glad when it was over. For our multiplayer playtest, we all completed our first quests, realized we were only a third of the way into the game, and packed it in. The problem is that the game is a flat line of complexity and excitement from start to finish. Quests are given out semi-randomly (you draw two, pick one of them), and while some are more difficult than other, they're all basically the same. Collect a ton of tokens, trade them in for bigger tokens, go to a place, trade them all in and maybe fight a monster. The rewards for completing the quests (Good Fortune cards) are actually pretty cool, but once you complete your first quest, you simply get a new quest and start the process again. And then once more. You're just doing the same thing over and over throughout the game. Those games that I love playing for hours? They develop over the course of the game. Your early military victories gradually give you an advantage in resources in Game of Thrones, your investments in technology facilitate your end-game plays in Twilight Imperium, and the infrastructure you built in Empire Builder pays off as you complete those last few connections to make your millions. This is the hardest problem to fix., and I'd love to hear some other ideas in the comments. You can obviously reduce the number of tokens needed to complete quests to speed things up. But I also think the game needs some kind of final quest, a special end boss mission that's really difficult to beat. Maybe you get some resources as you complete side quests during the game, and those are set aside to help you in the final battle. Or maybe it's easier to get those resources from other players, so it's smart to help them with quests and arrange trades that will get you what you need for the endgame. Hell, maybe this should really be a cooperative game, after all. This would really play up the strengths and weaknesses of the different characters. Uh oh, some kind of phantom ghost thing is in this region, better get Triss over there to defeat. A dragon? Geralt is armed to the teeth, he might be able to kill it. The reason this game is so frustrating is that there's a lot of potential. There are some excellent game mechanics, and the production values are fantastic. But the design missteps result in a bloated, boring game that just isn't much fun to play.